last weekend i visited my dear friends grant and leah up in the big apple. i hadn’t been to new york in a couple of years, and i found it was time for another visit. i’ll update the blog with my daily ventures, so check back in to see about all the fun i had. day 1 begins here! although i had been a touch groggy from my late arrival, the whipping winter winds shocked me awake as i stepped onto the friday morning streets of new york city. grant and i turned left onto west 16th, he making his way to work and i heading out for my first solo visit to the city. i made a quick stop at cvs to acquire some essentials and then scooted into murray’s bagels for some breakfast per grant’s recommendation. i was thrilled there was seating inside, so i ordered my whole wheat, everything bagel with cream cheese, and a small coffee of course, and stole a table for myself. 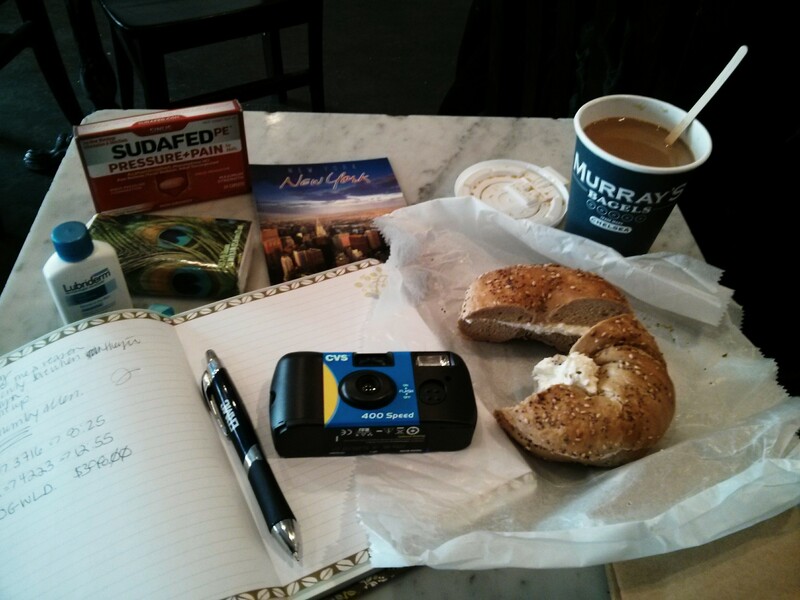 this picture captures my morning meal, and yes, that is a disposable camera you spotted. i wanted to go ultra tourist-y on this trip and leave nothing out. well, i take that back, i didn’t have a fanny pack. the bagel was fresh and delicious, due largely to the generous helping of cream cheese. i don’t care what anyone says – there’s no such thing as too much cream cheese. the coffee was tasty as well and only needed a splash of milk and spoonful of sugar. although my meal may not have been terribly adventurous, their menu is quite extensive for those of you who seek a little more variety in your breakfast. as i was finishing my bagel, a small lady with many bags squeezed her way to the table next to me. as she plopped herself down, she huffed and commented to whoever would listen “i’m not quite used to this” in reference to the close quarters. i reply back with a friendly laugh, “i hear you there. i’m used to a little more space myself.” she proceeds to tell me her story, how she and her husband are up from florida for their grandbaby’s first birthday. “well how about that!” i exclaim “i’m also visiting from down south. i live in georgia.” “oh, honey, another georgia peach!” she celebrates as her husband joins her. it turns out she grew up in atlanta but has lived in pensacola for the past 30 years. we proceed to chat for another ten minutes as her husband nods along in conversation while enjoying his lox. you just never know who you might meet. 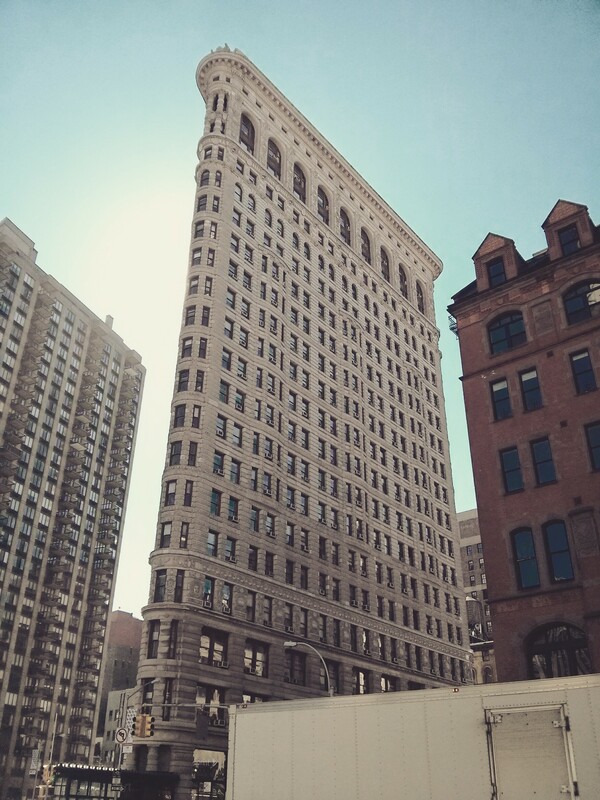 after getting hopped up on caffeine and cream cheese, i made the brisk walk to 23rd and 5th to see the flatiron building. originally called the fuller building, the flatiron building concept and design are owed to chicago’s daniel burnham and fellow designer frederick p. dinkelberg from pennsylvania. the structure was completed in 1902 and given the unfortunate nickname burnham’s folly because there was concern that, due to the geographical placement of the building, the wind currents and force would damage the building. to this day, it is clear that the strong steel structure of the flatiron building, which functions as an office building in present day, has withstood the test of time and mother nature. after moseying around for about ten minutes in the same block, i spotted signs to the brooklyn bridge. wonderful! in all my visits to new york city, i had yet to make it to this must-see sight. no time like the present! i began my trek, basking in the sun that filled the clear blue skies. as i made my walk, i realized i was still a while from the bridge itself. warning, it isn’t the shortest walk but it is quite pleasant. thankfully i was solo and could go along at my own snail’s pace. soon enough my feet found the wooden planks of the walkway and then the picture taking began. not just me but everyone around. no shame! the brooklyn bridge spans 1,595.5 feet and was the first steel-wire suspension bridge ever constructed. the bridge was originally designed by german immigrant john augustus roebling. upon his unfortunate and untimely death, design and construction were taken over by his son washington roebling, then 32 years old. washington roebling himself was then tragically paralyzed by caisson disease and unable to directly supervise the construction of the bridge. his wife emily warren roebling became educated in order to assist her husband with the overseeing of the bridge’s construction. upon completion in 1883, emily warren roebling was actually the first person to walk the entire span of the bridge. the bridge is of the neo-gothic architectural style, and the towers are built of limestone, granite, and rosendale cement. in the picture below, you see dozens of locks attached to the suspension wires of the bridge. they are called love locks. 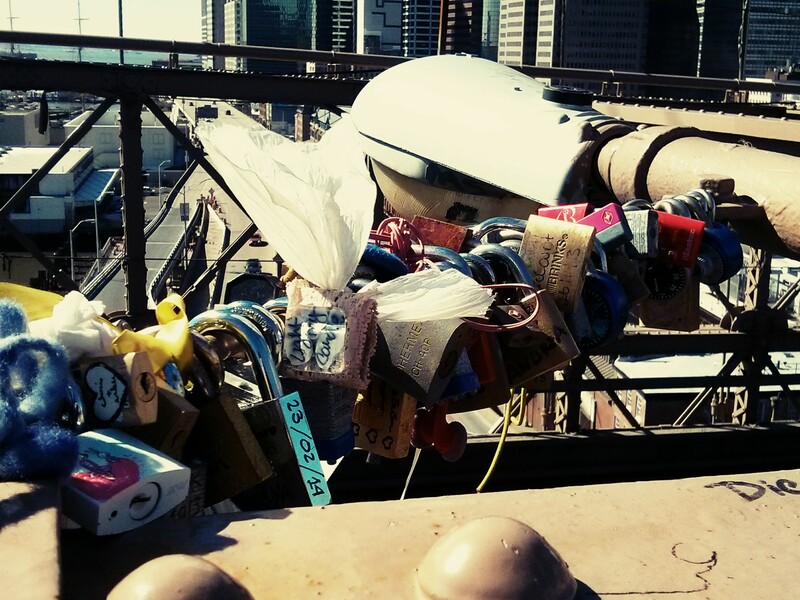 couples inscribe the date and their initials on the lock, secure it to the bridge, and then toss the key into the water to symbolize their everlasting love. this practice is copied by the countless bridges across europe where it probably originated. i snapped my photos and made my way back. although i’ve heard it’s must cooler to see at night, i’ll take the brooklyn bridge while i can. i took a few more turns and spotted my next destination with no doubt that i was in the right place. dozens of people surrounded the bowling green bull. a line had even formed on his backside to get a picture with his…you know…yeah, i opted out of that one. although the sun wasn’t primly placed, i squeezed through the crowd to get a few shorts of his front side. 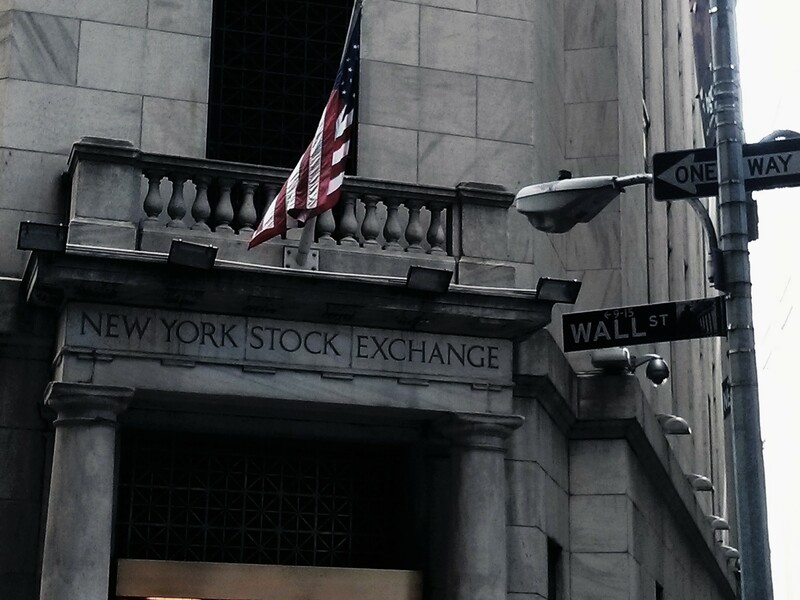 the bull was created, cast, and installed in 1989 for around $360,000 by sculptor arturo di modica as a symbol of the american people’s strength and power following the 1987 stock market crash. it actually is one of five bulls. the bund bull is in shanghai and a third bull is in het beursplein in amsterdam. i decided it was time to make my way back uptown, not that i had any idea of what to do but to go north. i hopped aboard the 1 from staten island and settled in for the ride. (look at me, trying to sound all “new york.” i’m not fooling you, am i?) i was able to grab the slightest bit of shut-eye before i de-trained at times square. no new york visit is complete without a walk through times square! i think one of my favorite things about times square is how commercial it is. i about died when i saw the ruby tuesday’s. but hey, if you build it, people will come, right? i rested in the heat of the sun for a few minutes as i decided on my late lunch spot. i headed south a few blocks and here i am, at bxl café, telling you fine people all about my day. i had queried my yelp app for dine-in spots. bxl café appeared and i decided without hesitation that is where i wanted to be. i found it with no trouble at all and quickly took refuge within their doors. i found a stool at the bar, hung my coat, and settled in for a bit. the bartender warmly greeted me and suggested the leffe blonde. day drinking? why not! no reason not to. bxl is a bar with a welcoming disposition and honest mission: good food and good drinks. they’ve been serving the locals and home-sick belgians since 2004. i figured a plate of food would be a good idea with my beers, so i ordered the calamari. it arrived shortly thereafter and proved to be a great choice. it was well-cooked, still chewy, which is what i like. the sauce had the slightest kick that complemented the calamari well. i wish i had focused on eating it while it was still warm because it was quite tasty. i could feel the leffes taking their effect as a group of successful 20-something men sat to my right. although i was busy writing and couldn’t do the best eavesdropping, they seemed to be making some bro time in their friday afternoon. oh, thank you, bartender, for refilling my water glass. i finished off the calamari and my second leffe, bundled up, and quite reluctantly trudged back out into the cold. i footed the short trip to bryant park just to check things out. i only wish it were warmer than thirty degrees out! wait, if i’m wishing for things, i also wish it were spring and that the trees were in bloom. i can only imagine how beautiful this block is when the warmer months are here. i rounded the corner to find the 5th avenue entrance to the public library. i wasted no time climbing the stairs to the warmer inner rooms. i found a seat in an upper hall amongst hundreds of other visitors, unpacked my bag, and observed the space in awe. i honestly felt like belle in beauty and the beast when the beast gifts the library to her. the ceilings seemed to reach the sky, and full shelves lined the walls as far as the eye could see. while i sat writing, i looked at all the other patrons around me, wondering why they, too, find themselves here. schoolwork, business, pleasure? i suppose i’ll never know. it is quite something, though, to see so many people in a place with such humble purpose. a library. i put my pen down as i pulled out my book to enjoy my surroundings and simply read and be. i then headed back home to rest my feet and arrived a short hour later. leah, bo, and i lounged about, catching up on everything and anything. grant got home from work around eight and we made the walk to spice for some thai cuisine. by new york standards, spice is actually on the larger side. we were seated right away at a trendy table next to the bar, and i caught grant and leah up on my whereabouts for the day. it was clear we were all a little taxed from the long week we’d already had; we all were quite low energy, and a more subdued evening was fine by us. we started with an order of the chicken skewers. they were grilled perfectly and complemented quite well by the side of peanut sauce. needless to say, they didn’t last long. dinner arrived in an orderly fashion. the maman curry leah ordered looked delicious, as did the half duck grant had in front of him. i kept things quite simple with the chicken and shrimp pad thai. it was just what i wanted and i was satisfactorily pleased. as our stomachs filled, we requested boxes for the leftovers and strolled home.